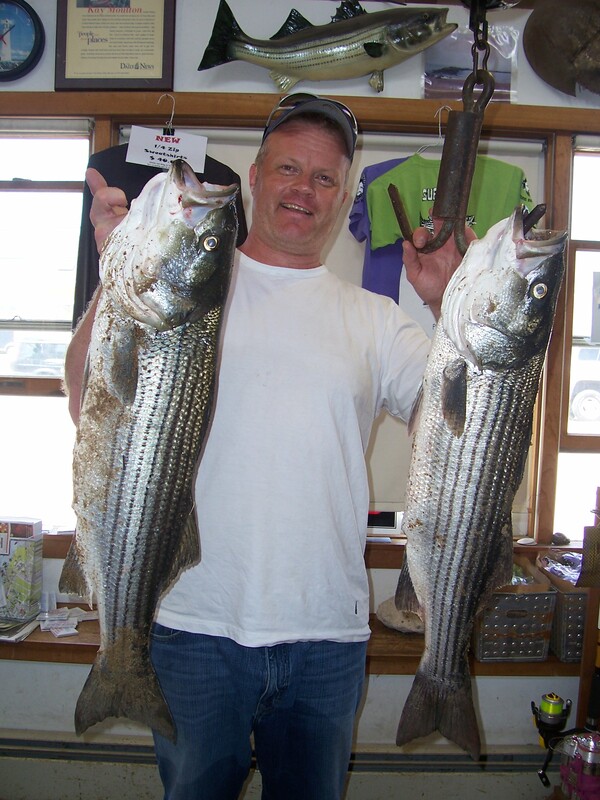 Surfland Bait and Tackle – Plum Island Fishing » Wednesday 25th…………Fish at Noon! Well the fish like this beautiful weather. Today the sun is shining and the fish are biting. The outgoing tide through the slack into the start of the incoming produced fish today. These two lucky anglers have some fish for their supper tonight. Paul Pierce from Holden, MA fished the outgoing tide down at that river and caught these two fish, one on worms, the other on clams. He caught them at the bottom of the tide. Paul had planned to stay for the day, but he has his limit so he went home to fillet. Paul’s fish weighed in at 13-14, and 12-14. I stopped at Tucks Point this morning on the way to school and the stripers were hitting the surface all around the dock, but weren’t biting anything I was throwing at them. Any suggestions? Worms with clams and maybe a beautiful mermaid??? Good luck!